Coot (Fulica atra). Taken at Farmoor, Oxon., on February 2nd 2012. Taken at Farmoor, Oxon., on February 2nd 2012. The Coot is an all-black bird with a white beak and white shield above the beak. It has strong feet, and long, lobed toes. 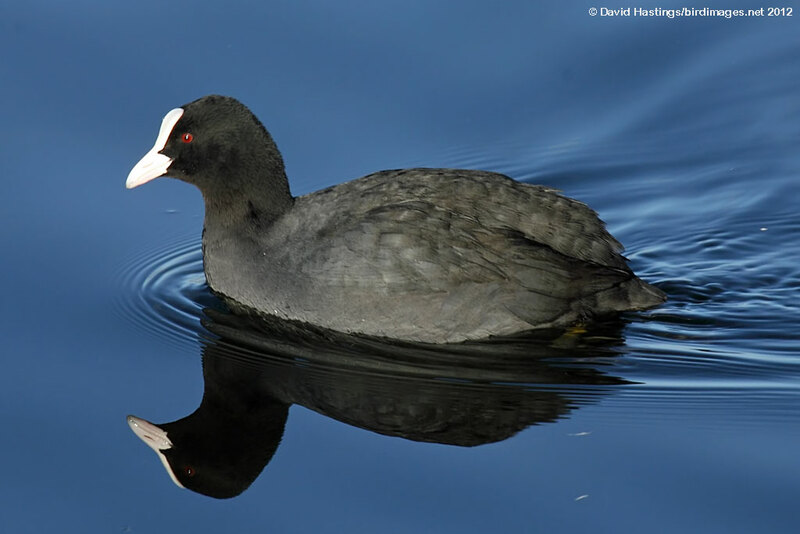 Coot can be found throught the British Isles with the exception of north-west Scotland. They are mainly found on freshwater lakes, gravel pits, reservoirs, rivers and town park lakes when deep enough. Sometimes seen offshore, especially in winter if freshwater areas are frozen. The Coot is much less secretive than most of the rail family, and can be seen swimming on open water or walking across waterside grasslands. It is an aggressive species, and strongly territorial during the breeding season. It is reluctant to fly and when taking off runs across the water surface with much splashing. It does the same, but without actually flying, when travelling a short distance at speed in territorial disputes. It bobs its head as it swims, and makes short dives from a little jump. There are between 22000 and 28000 breeding pairs in Britain. Over 180000 birds over-winter here. It has green status on the British list.